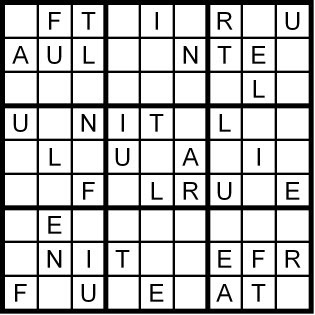 Today’s 9x9 Classic Word Sudoku puzzle is based on the word ULTRAFINE. This state entered the union on April 30, 1812, the 18th state. 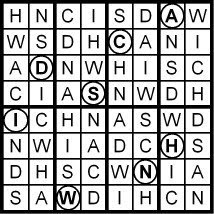 Yesterday's Extra Qudoku puzzle set provided three answers to the latest Constant Consonants puzzle from Karen Richards at http://puzzlebits.wordpress.com/. 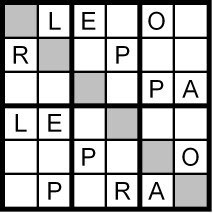 How many words can you think of that contain R and L, in order, and include no other consonants? 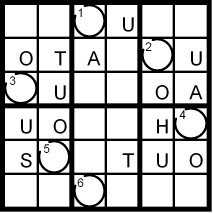 A new Word Sudoku puzzle in a few hours. 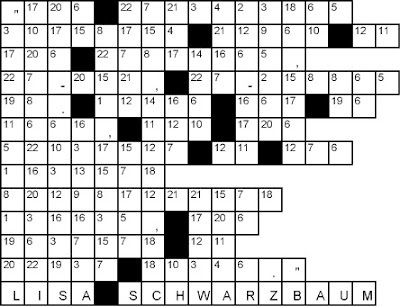 And tomorrow, May 1, I'll begin an entire month of Qudoku puzzle sets (with a few exceptions on Sundays). 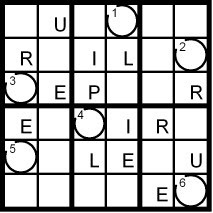 Yesterday’s Classic Word Sudoku puzzle was based on the word EXPULSION. 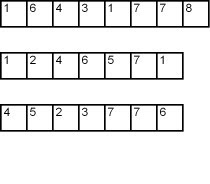 Given a list of consonants, how many words can you think of that contain the listed consonants, in order, and include no other consonants? 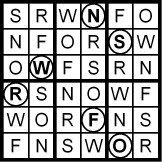 Karen Richards poses this Constant Consonants puzzle a couple Mondays each month in her puzzle blog http://puzzlebits.wordpress.com/. 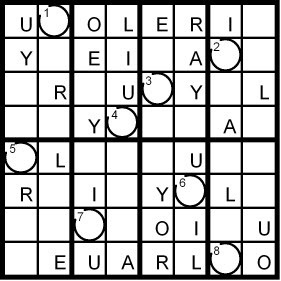 Please visit her blog for full rules and other intriguing puzzles. 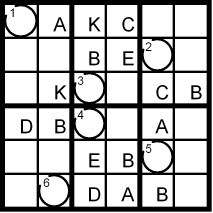 I first try to solve Karen's puzzle; then I try to make Word Sudoku puzzles out of a few of those answers. 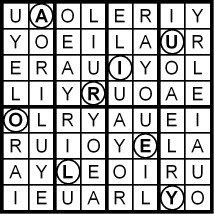 Here's a Qudoku puzzle set supplying letters to spell out three of the longest answers I found for the consonants RL, the puzzle Karen posted Monday, 4/27/2009. Solutions in the morning. 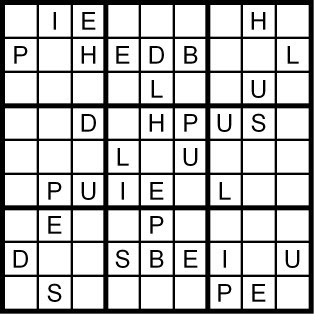 Please visit Karen Richardson’s puzzle blog http://puzzlebits.wordpress.com/ for the complete Constant Consonants rules, her (undoubtedly many more!) 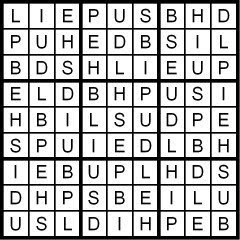 solutions to her puzzle and many other brainteasers, as well. 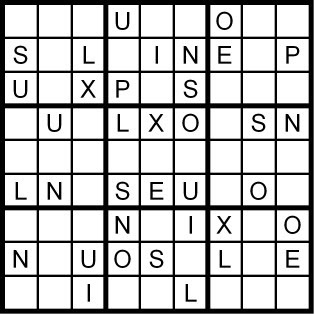 Today’s 9x9 Classic Word Sudoku puzzle is based on the word EXPULSION. This state entered the union on April 28, 1788, the 7th state. 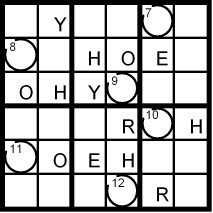 Yesterday’s Classic Word Sudoku puzzle was based on the word WINSOMELY. 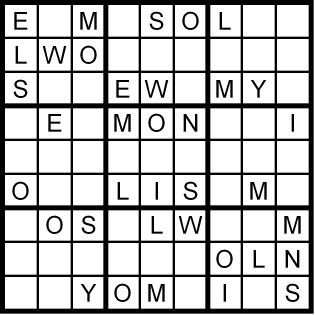 Today’s 9x9 Classic Word Sudoku puzzle is based on the word WINSOMELY. 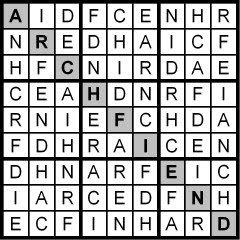 Yesterday’s Hidden Word Sudoku puzzle was based on the letters in the anagram NADIR CHEF. 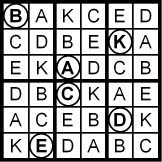 Today’s 9x9 Hidden Word Sudoku puzzle is based on the letters in the anagram NADIR CHEF. 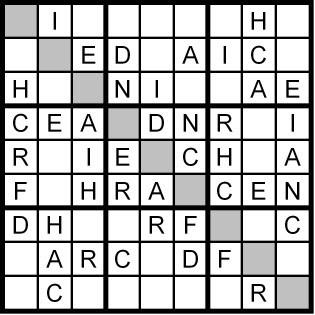 Yesterday’s Sunday Challenge Hidden Word Sudoku puzzle was based on the letters in the anagram TIMER KNOW LAG. 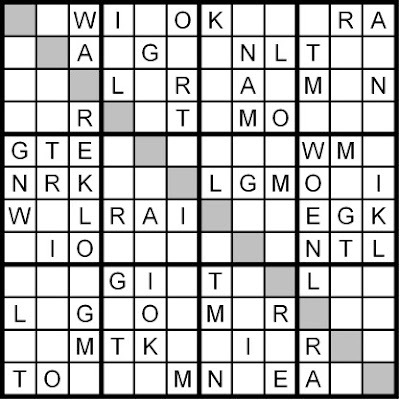 Today’s 12x12 Hidden Word Sudoku puzzle is based on the letters in the anagram TIMER KNOW LAG. 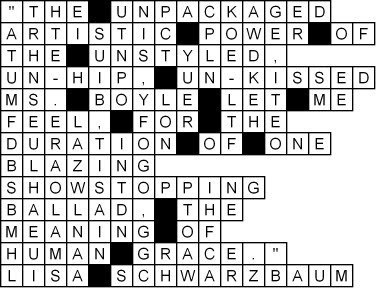 Yesterday’s extra Word Sudoku puzzles spelled out a quote from Entertainment Weekly’s Lisa Schwarzbaum on how she (and many others, including me) felt after watching British woman Susan Boyle sing on “Britain’s Got Talent.” Lisa’s full quote is at http://popwatch.ew.com/popwatch/2009/04/susan-boyle-why.html, and Susan’s amazing performance is at http://www.youtube.com/watch?v=9lp0IWv8QZY. 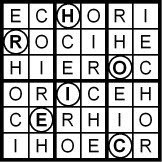 Yesterday’s Diagonal Word Sudoku puzzle was based on the word LIVESTOCK. 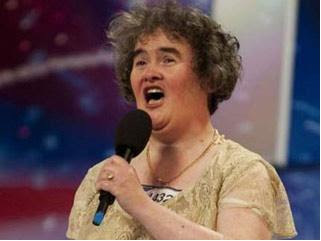 Today’s extra Word Sudoku puzzle is prompted by the extraordinary event we’ve all seen online by now: the singing of Susan Boyle, the British woman who appeared on “Britain’s Got Talent” not quite looking the expected part…but blowing away the audience with her performance. If you haven’t seen it, check out this YouTube video of her singing: http://www.youtube.com/watch?v=9lp0IWv8QZY. Even though I’ve given it away—you know she wins big—if you’re at all like me, you’re cringing for her as the audience and the judges view her rather cynically: She’s going to sing like a famous British singer? Yeah, right! And then…she does. What is it that makes many of us jump to conclusions based on first impressions, so that we’re deeply cynical of others whom we judge harshly? And what is it that makes us turn around so quickly, like the audience here, which was cheering from the second note? And why do many of us start crying, as we watch this video? And not just the first time we see it? But Entertainment Weekly’s Lisa Schwarzbaum said it much better than I. 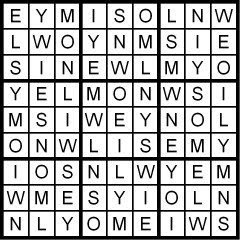 The Word Sudoku puzzles below provide you the letters; place them in the numbered cells in the quote grid to spell out Lisa’s reaction to watching Susan Boyle sing. I think Ms. Schwarzbaum speaks for a great many of us! Solutions in the morning. By the way, breaking my no forwarding rule yet again, you may remember that this isn’t the first time that someone has knocked the socks off the judges and audience in “Britain’s Got Talent.” Remember Paul Potts, the mobile phone salesman who wanted to be an opera singer? Here’s a YouTube link of his performance: http://www.youtube.com/watch?v=y703tPc4PRk. It’s also phenomenal. And for pure spirit uplift, check out this YouTube link showing what amounts to a ‘street dance’ to “Do Re Mi” from the soundtrack of “The Sound of Music” in the middle of a Norwegian train station: http://www.youtube.com/watch?v=0UE3CNu_rtY. If you aren’t feeling better after watching this, you’ve forgotten how! 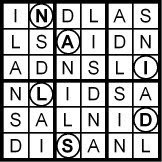 Today’s 9x9 Diagonal Word Sudoku puzzle is based on the word LIVESTOCK. 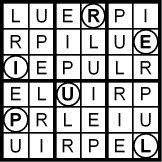 Yesterday’s Classic Word Sudoku puzzle was based on the word EUPHORIAS. 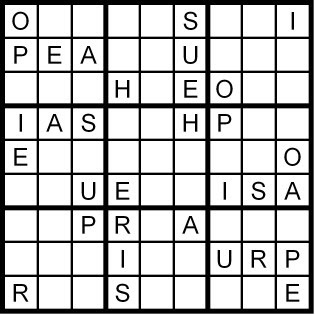 Today’s 9x9 Classic Word Sudoku puzzle is based on the word EUPHORIAS. 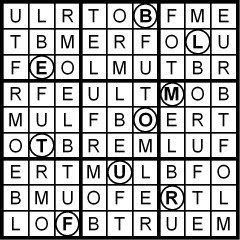 Yesterday’s extra Word Sudoku puzzles and Qudoku puzzle sets were based on a ‘Constant Consonants’ poser last Monday on another puzzle blog, http://puzzlebits.wordpress.com/. 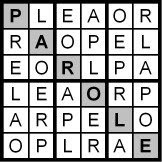 Karen Richards asked, How many words can you think of that use the consonants PRL in that order, and no others? 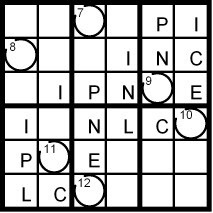 I presented a Hidden Word Sudoku puzzle and two Qudoku puzzle sets based on a few of the prl words I came up with. 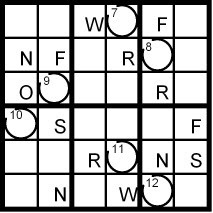 Today’s regular daily Word Sudoku puzzle will be published in a few hours. 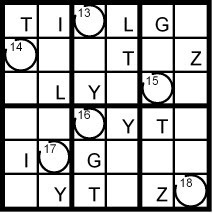 Yesterday’s Classic Word Sudoku puzzle was based on the word PUBLISHED. 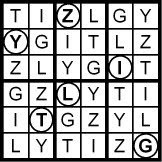 Today’s extra puzzles are based on a ‘Constant Consonants’ puzzle posed last Monday by Karen Richards at her blog, http://puzzlebits.wordpress.com/. 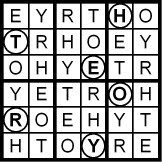 She asked: How many words can you think of that use the consonants PRL in that order, and no others? 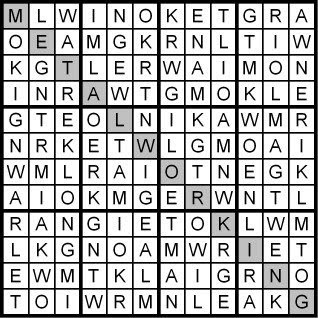 I just started trying Karen’s puzzles a few weeks ago, and up until this one, they came fairly easy—I certainly didn’t come up with as many words as Karen did, but I was reasonably respectable! This one? I came up with about a dozen. Harder! Although that's half the fun, isn’t it? 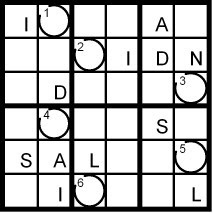 Today I’ll give you four solutions to Karen’s puzzle, inside Hidden Word Sudoku and Qudoku puzzle sets. 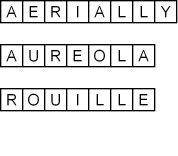 I’ll begin with one puzzle showing you two solutions—although they’re different words, they contain the same distinct letters. 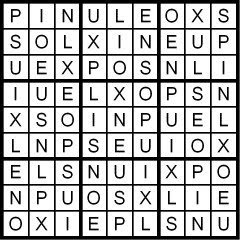 The next solution to Karen’s puzzle poser is spelled down the diagonal of a 6x6 Hidden Word Sudoku puzzle. 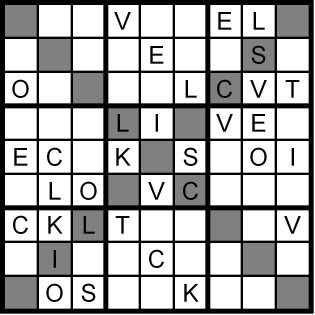 Finally, one more, because I like it: it’s one of the longest words I found, 7 letters; but it contains the smallest number of distinct letters of any solution I found: only 5. And I'll give you one! 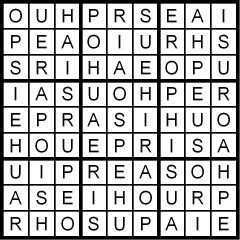 Today’s 9x9 Classic Word Sudoku puzzle is based on the word PUBLISHED. 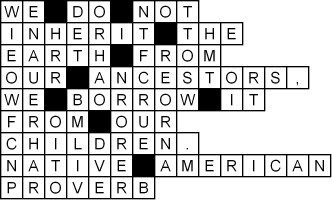 Yesterday’s Qudoku puzzle sets spelled out quotes on the meaning and importance of Earth Day. 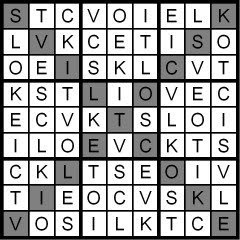 Please let me know if the different grid sizes threw you: did that make it too difficult?